History of Samnium and Samnites - Samnite warriors and Legio Linteata. The Samnites were valiant warriors and well organized. Like many nations, then and even now, they had their own army, and a nucleus of chosen warriors forming a special corps. This was called Legio Linteata, a devotio, in reference to the Samnites's Olympus Gods whereas, after a special ceremony, a caste of warriors vowed their extreme sacrifice in order to defend its people. Titus Livius narrated in his Annales the induction ceremony regarding this special corps. ... The Samnites readied themselves for war with great commitments and abundance of shining armors. And invoked their Gods' help for the initiation ceremony taking an oath according an ancient rite. And in the Samnium territory they ordered a conscription with a new important clause whereas those soldiers refusing to answer the call from their commanders or avoiding it, would be subjected to Jupiter's curse. Afterwards, the army would be ordered to meet at Aquilonia's. Almost 60 thousands strong, the best samnites troops, would there assemble. THE PLACE OF THE LINTEATIS' SWEARING IN CEREMONY. Here, almost in the center of the camp, they encircled the area, almost 200 feet large, with fences draped with pieces of cloth. According to what is referred in an old linteo book, this is the place where a sacrifice was offered. A certain middleage priest, named Ovio Paccio seems to have obtained information about this sacred rite from and old samnites' ceremonial, to which his forefathers adhered to, when secretely had deliberated to overtake Capua from the Etruscans. As soon as the sacrifice ceremony ended, the supreme commander would ask an assistant to call up the most nobles for lineage and army endeavors. Each one of them was now introduced. Besides sacred displays to justify religious awe, in the center of the fenced area all around draped, there were altars and bodies of victims, and in a circle, an unit of warriors with drawn swords. More like victims, the inductees were taken before the altars. Each one must had sworn never to reveal anyone what he was about to see or hear in this place. He was then forced to swear an horrific oath to invoke malediction upon himself, his family and his descendants, if he ever would refuse to go and fight when he was so ordered, if he avoided the call, or if he had witnessed somebody deserting and he had not killed him. Those refusing taking such an oath, were then slain around the altars, their bodies thrown in the heaps of the victims being this a lesson to those thinking of a refusal. When the notables would have pronounced this curse, the supreme commander would then induct 10 linteati and each one was given a choice to select a buddy. And this induction would proceed until they would reach 16000 strong. This legion, appropriately, was called 'linteata" taking the name from the covering of the fences in which this new nobility had been consacrated. To these warriors now were given shining armors and plumed helmets so that they can easily be distinguished. There was also another army of about 20000 men of lesser statute than the linteatis but just very able physically, for achieved glories in the wars, and for the weapons entrusted upon them. This body of men, the heart of the military, took camp around Aquilonia (1). Another episode taken from the Annales also refers to the Legio Linteata but dated around 309 b.C. 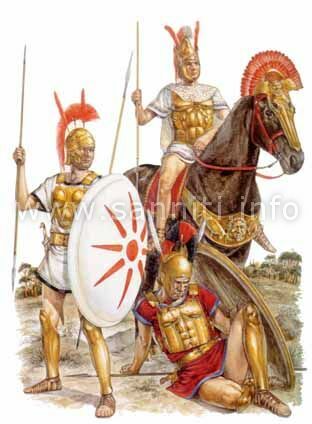 The warriors were described as wearing golden or silver armors. Of the two armies, one used shields made of gold, the other of silver. The following tells us how the shields were made: "The upper part, larger than the rest to protect chest and and shoulders and horizontal at the very top. The lower section, more pointed to facilitate freedom of motion. In order to protect the chest, they would use armor mesh and wore shin-guards to shield the left leg. Plumed helmets to better emphasize one's height. Multi-colored tunics worn by soldiers wearing golden shield, candid linen instead for those protected by the silver one (2). In effect Livius' description of these armies aimed at showcasing their gladiatorial prowesse might be due to the fact the Samnites were reknown as the most deft yet cruel fighters in the arena. And to evidence even more the special fame attributed to the Legio Linteata, if it ever existed, it seems that Livius underscored the claims and efforts, sometimes purely fictional, of the Romans' morbid desire to destroy this fierce legion. Titus Livius in his Annales cites the Linteati in the same way he would have described a roman warrior nobleman. Infact he writes of the Samnites Linteati wearing a special armor called "Lorica Linteata", kind of surcoat interwoven with iron mesh that in the 3rd century b.C. only a roman graduate was allowed to wear, armor very expensive yet difficult to wear. This armor would have been worn by all the roman soldiers only after the half of the 2nd century, eventually substituted by the "Lorica Segmentata", around the 1st century, destined to become the symbol of the roman soldier. It is more probable that the Linteati's armor would have been made similar to the ones used around the end of the IV century b.C. by the people of southern Italy, more in tune with the greek colonies having more knowledge in illustrating as well as rendering military artifacts.. 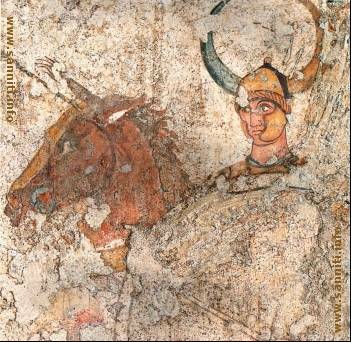 In some reperts found in some tombs in Paestum this special armor was indeed raffigured,together and along with frescos representing shin-guards and plumed helmets. This particular armor would not coincide with the bronze discs protection of Italics used around the V century b.C. 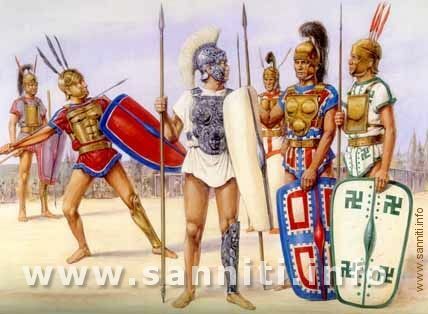 (3) The image of samnite warriors is published in: "Early Roman Armies", Osprey Military Men-At-Arms Series #283 - Reed Consumer Books Ltd., Michelin House, 81 Fulham Rd., London SW3 6RB, England - Painting by Richard Hook.